The world's fastest submarine in 1950, the Albacore, is tested at Langley for drag characteristics in a NACA wind tunnel. 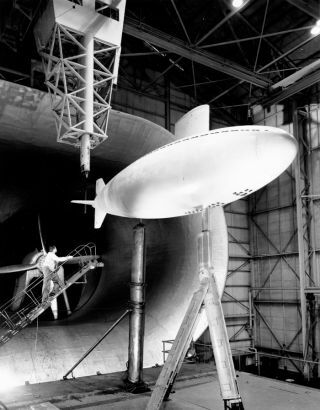 In this historical photo from the U.S. space agency, in 1950 Langley tested the drag characteristics of what was then the world's fastest submarine, the Albacore, in the 30 x 60 Full Scale Tunnel. Water and air are both essentially fluids of different densities. Air traveling at high speed can simulate water traveling at lower speed for many purposes.